VIP toilet cabin High Tech II provides the most upscale portable restroom experience available today. 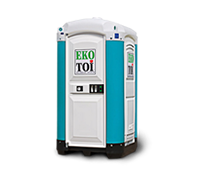 It is the most luxourious mobile toilet in the world. With a fresh flushing system, stainless steel bowl, internal wash station, overhead solar light, built-in paper towel receptacle, and large mirror, it has all the comforts of home. End users operate the flushing system and hand wash station with a foot pump, which allows for hands-free, germ-free operation. Most of all, each component is designed to form a beautifully contoured interior.